Timothy Koch was beaming as he brought his young son, Logan, into Hangers to Hutches a few days before Christmas. Little Logan had a brand new Adventure Wheels in his arms that he wanted to donate. Logan was beaming as well, the father – son matching smiles were just alike. Dad began to tell us that Logan wanted to make sure that another child would have at least one gift for Christmas. So our “Elf” dad was more than pleased to help his pint-sized “Santa’s” wish come true. Logan was eager to tells us what his desire was and quickly posed for this sweet photo of his donation. 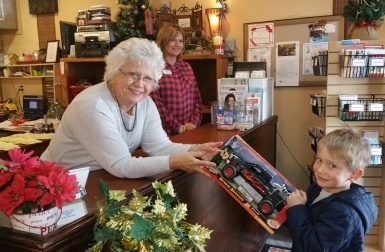 There is nothing more priceless than the giving spirit of a child who understands, at such a young age, that the holidays are a time to think of and bless others…GREAT JOB LOGAN! Pictured from left to right: Elizabeth Robinove (Asst. Mgr), Liz Rael (Sales Associate), Logan Koch.